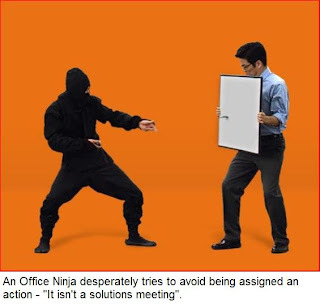 Employees at a large financial institution in the Docklands area of London were said to be amazed by a rare sighting of one of the elusive breeds of middle manager known as the “Office Ninja”. These are those special groups of managers who seem to be able to get into the office in the morning, claim a full day's work and leave without anyone either seeing them, nor any trace of their presence. “It was quite a special moment, even though we only caught a brief glimpse of what might have been our long lost boss,” said Sarah, an office worker near Canary Wharf. “We thought we had seen him several years ago, when a few of the girls claimed to have felt a breeze in the air as he went past but we weren't even sure if he still worked here. Of course it might just as easily have been a reflection or a trick of the light, since we can't quite remember what he looks like." Whilst the mature Office Ninja is rarely seen, sometimes the juveniles are more easily spotted as they have yet to fully master the mystic ways of the Office Ninja and only inexpertly pass off their seemingly few tasks to harassed and overworked underlings. Heard in the early afternoon, the Office Ninja's distinctive cry of “Just off to the other building for a meeting, I'll go straight home from there.” might be the only indication that one is nearby. Little is really known of their behaviour, although recent evidence has it that they are dependant upon Blackberries – which they use to leave short messages about repeated family disasters that mean the Ninja will, once again, not be seen in the office. For many people the only time they may see such a rare specimen is when one of the older Office Ninjas is eventually made redundant, although this normally happens many years after they have actually stopped working. fab story, very very clever and we all knw at least one i think!! !